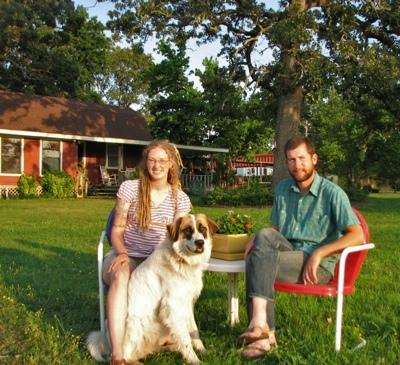 Red Moon Farm calls East Texas home. On our 38 acres in Van, Texas, our family farm runs on a passion for sustainable agriculture. With a combined 15 years of organic farming experience, our mission is to provide East Texas families with safe, clean, chemical-free food through our CSA and the bounty we sell at local farmers’ markets. We’ve lived through droughts and we know the challenges of this land, so we’ve adopted conservation practices to keep our soil healthy and our food full of life-giving nutrients. And because our focus is on the food—what you eat!—we keep it completely clean. Organic means picking a golden cherry tomato off the vine, warm from the sun, and bursting it in your mouth. It means no chemical fertilizers or pesticides. It’s our promise. Many of you we’ve met at Tyler’s Rose City Farmers Market, or you’ve come along for the ride in the transition from our former farm over in Yantis, Texas Daily Harvest. Whatever the case, we’re glad you’ve found us. We believe that honest food builds strong communities, and we’re grateful for the chance to build that here. Take some time to read about our CSA, see what’s new on the farm, or learn how we’re using our produce in our kitchen. We’re always cooking up something good. In addition to farm duties, Jessica also provides birth doula services across East Texas and crafts a line of organic herbal body care products from medicinal plants grown right here at Red Moon Farm. Find out more about Jessica’s work at www.nobarriersbirth.com.